So it’s just a few days until the Fourth of July and everyone is coming to your house to enjoy your awesome backyard and beautiful Tampa Bay pool. There’s only one problem. The summer has flown by and what was June is quickly turning into July and you haven’t planned anything yet. Well, have no fear because we have some great last-minute Fourth of July party planning ideas. Make it easy by sticking to the staples. 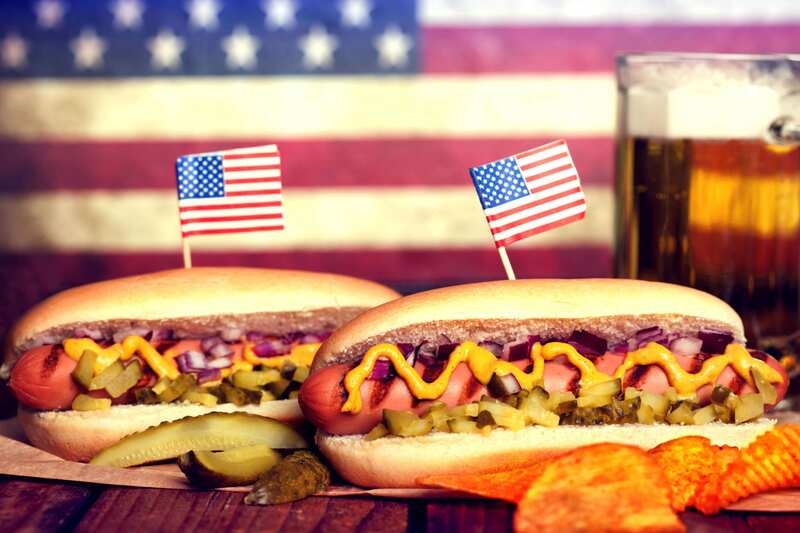 Grab some hot dogs and burgers (don’t forget the buns) and get a variety of condiments to give guests a choice. It’d also be a good idea to get some cheap containers to keep food in and keep the bugs away. Remember to get plenty of plates, silverware, cups, napkins, and buy them in red, white, and blue if possible for some easy decorating. Load up on drinks and chips, buy some cookies and sweets, and you’ll be set. Pro-tip: Ask guests to bring a side dish or dessert of their choice. Flags are what you need for a Fourth of July party. Most stores will have a wide selection of miniature flags that you can stock up on and place strategically around the backyard. There will also be big selections of pretty much everything you need in red, white, and blue. A place like Party City will have more decorations and supplies than you could ever need. Head there and get your decorations done in no time. Pro-tip: Buy plain white cups and provide red and blue markers to create their own party cup. Besides the pool, provide guests with other ways to have fun while at the party. Depending on your local laws, fire crackers are always a good idea. Of course, sparklers and snappers (those little paper things that pop when you throw them) should be ok everywhere. Black cats and really loud fireworks will depend on your guests. Small kids probably won’t like them and if the pets will be attending it’s probably a good idea to skip them. If nothing else, get some bubbles for the kids to blow and chase around. If it’s a more adult party, the drinks will probably be a large part of the fun at any Fourth of July party. However, good music will always help and larger fireworks might be in order. Just stay safe and follow local laws. Adults will, of course, also appreciate the pool and getting a big Fourth of July themed pool float will be fun and be another easy decoration. Water guns are fun for all ages. With a Tampa Bay pool, backyard entertaining is easy. We’ve been designing and building perfect party settings for over 15 years. We’ve gotten quite a few awards along the way and offer hundreds of design choices that let you make it yours. Talk to a Tampa Bay customer and they’ll tell you about our family values and customer service too. So if you have a Tampa Bay pool, enjoy your easy Fourth of July backyard party. If you don’t have one yet, get in touch with us and start enjoying parties year-round.